I so enjoyed my first visit to Mr. John’s Steak House that when a friend asked me where she and her husband could take me to dinner, I told them I wanted to go back for another meal. Being used to spoiling me on my birthday, they agreed. This visit was just as good. The cocktails we started with (sidecar and sazerac) were perfectly blended. My friends enjoyed some French Onion Soup which was rich and hearty and no-one choked on the cheese (my paternal grandmother was forever warning anyone who ordered such a soup as to the dire consequences awaiting you). I had the ribeye again and they went for the filet mignon and the petite filet. The filet was just a little dry for my taste but that could have been because the marbling on my piece of meat made mine extra juicey! The sides of potato au gratin were super hot but filled with creamy, cheesey goodness. I only had a bite of the spinach au gratin to reaffirm how much I hate cooked spinach. As they had told them when making the reservation that it was my birthday, we enjoyed another complimentary bread pudding with our tawny cinnamon port. Not a bad ending to any meal. I’ve also got to give kudos for the service–the waitstaff is attentive without being obtrusive, water and iced tea is filled before the level drops below the half way line, all the plates are delivered to the table at the same time. We got there at 7:30 and were the second to last table to clear at 10pm and they never made us feel rushed or that we should take our conversation elsewhere. A definite must stop on any trip to the French Quarter is Central Grocery. I usually pick up some spices, cans of lentils, olive oil and hot sauces. When I have friends in town and we’re looking to picnic or a quick bite, we also grab a muffuletta (a sandwich which consists of a loaf of Sicilian bread, split horizontally and is then covered with a marinated olive salad, layers of capicola, salami, pepperoni, emmentaler, Ham and provolone). Central Grocery claims to have either created or perfected the muff and I have to admit that theirs is very, very good. While not layered as thick as it used to be, it is still a good combination of flavors on good bread that pairs well with a bag of Zapp’s chips and a root beer. I also have to admire how quickly they move the line that can fill the small space at lunch time. What I don’t like is how utterly rude they are. They won’t answer questions, they won’t explain what’s on it, they won’t make special orders, etc, etc. Now, I’ve worked counters before and I know how aggravating it can be to be asked the same question a million times but they are in a customer service business and a little bone thrown to clueless tourists must surely take several years off your scheduled stint in purgatory. And there is a difference between brusque and rude–they come down solidly on the rude side! 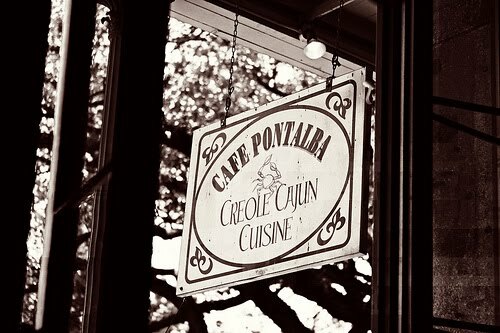 Situated on the corner of Jackson Square, Cafe Pontalba has one of the best locations in the city for foot traffic. Perhaps that is why it serves pretty darn bland southern and soul food. Very much a tourist trap, don’t go into it expecting great food. I was with some folks who were exhausted from walking the French Quarter and were fine with the people watching. The fried shrimp po-boy was served on stale bread, the brown gravy on the roast beef sandwich tasted canned. I’ve spoken before about my neighborhood Creole Italian restaurant. It is within walking distance of my house, which is a good thing when you need to work off a bit of over indulgence. Pascale’s Manale is upscale and is best known for their Barbecue Shrimp. This last visit we all decided to branch out and try something new. Helen had pasta with meatballs. The two meatballs were huge and quite flavorful. Butch had the veal gambero that came with a couple of peeled bbq shrimp. The veal was paneed and very flavorful. I kept reaching across to dip my bread into his bbq shrimp sauce. I had the crabmeat alfredo–lots of lump crab meat and two spicy crab cakes. Because the crab cakes were so well seasoned, the alfredo sauce came across a little bland. As usual, we had a very friendly server who occassionally got distracted by his conversation to the detriment of getting menus and the order taken but, we weren’t in a rush, so it wasn’t such a bad thing. Next to the theater/stage area of the National World War II museum is John Besh’s American Sector cafe. The menu is pretty eclectic with a mix of New Orleans’ staples and fusion inspired takes on comfort food. I had the spicy garlic glazed fried chicken–a very nice heat to the coating made them finger licking good. The mix of pickles that came with it (watermelon rind, squash and daikon) were a cooling touch. My friends got the fried green tomatoes with shrimp remoulade–the coating was a little thin but they had a good flavor–and the shrimp po-boy that came with homemade potato chips. The fish fry batter was nice and crisp on the shrimp. This is a good place to take a break between D-day exhibits, the film and the other sites. Plenty of folks who work in the Warehouse District also go there for lunch. I’m a fan of Chef Besh’s red velvet cupcake, so make sure you leave room for at least one! Not so much a restaurant as a dive bar, 12 Mile Limit is located in Mid-City. They serve barbecue, cocktails and cupcakes, so that is why I included them here. The cocktails are pretty fancy but without the fancy price. The cupcakes come regular size and as a DoBite which usually comes paired with a cocktail or a shot. The BBQ comes in cow and pig and is fork tender. The mashed potatoes were out of this world–creamy with cheese, green onions and a bit of potato skin left in. All in all a perfect neighborhood bar to relax after a day of work. They even have some board games in addition to the video of poker for folks to make a night of it.